Bournemouth chairman Jeff Mostyn has defended the increase in season ticket prices for the club's first season in England's top flight. The club currently have 7,000 season ticket holders, with that number being capped for the 2015-16 campaign. The average adult season ticket has risen from just under £600 to £687 and Mostyn believes the club have been "respectful" to their supporters. "As a business, it is essential that we provide value for money," said Mostyn. "In this respect, there can be no question that our ticket pricing remains more than competitive in comparison with other Premier League clubs." Bournemouth's cheapest adult season ticket is priced at £550, with the most expensive at £950. In 2014-15, the average price of the cheapest Premier League season ticket was around £508. Manchester City offered the cheapest at £299, while Arsenal's cheapest was more than £1,000. "Whilst I know supporters of any club, given the choice, would prefer no increase in season ticket prices, I sincerely hope the vast majority of our supporters will understand this increase given our new Premier League status," said Mostyn. "Next season, so many of the world's elite teams and players will be visiting the stadium, displaying a vast array of skills and they will, in every respect, be box office attractions. "When you also consider the fact that that our capacity is under 12,000, and the effect that has on matchday income, we believe we have been respectful in our pricing structure." 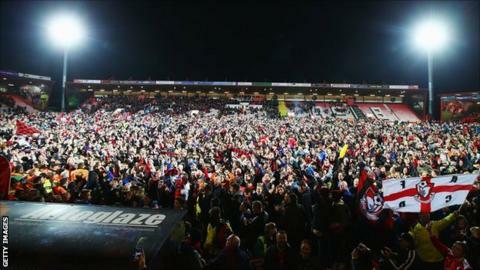 Promotion to the Premier League is expected to earn the club around £120m and, on Monday, Bournemouth announced they had shelved plans to increase the size of their Goldsands Stadium home, with capacity remaining at 11,700. And with a combination of season-ticket holders, away fans, hospitality, press and complimentary tickets, around 2,500 tickets are expected to be available for general sale for each home game.